Hooooooooogaaaan! Okay, this game is completely unrelated to Hogan’s Heroes. In fact, if memory serves, Hogan’s Alley was a training course used by the FBI. A Hollywood-style set was built, and cardboard cutouts of bad guys and innocents would pop up from windows and alleys. The agent in training had to make split second decisions on when to use his weapon and not. Well, playing this game won’t score you the G-badge, but you can pretend if you want. 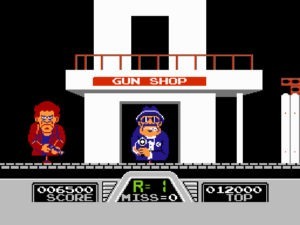 Hogan’s Alley is a game fairly similar to Duck Hunt, and requires the Nintendo Zapper to play. You have three games to choose from, all slightly different but basically the same idea. The unique features here are the opportunity to play through shooting galleries of mobile bad guy targets. You’ll always be clearly shooting “fake” targets on sticks, and never “real” people, but the challenge does increase as the game goes on. The real novelty is having enemies and innocent bystanders on the screen at the same time. 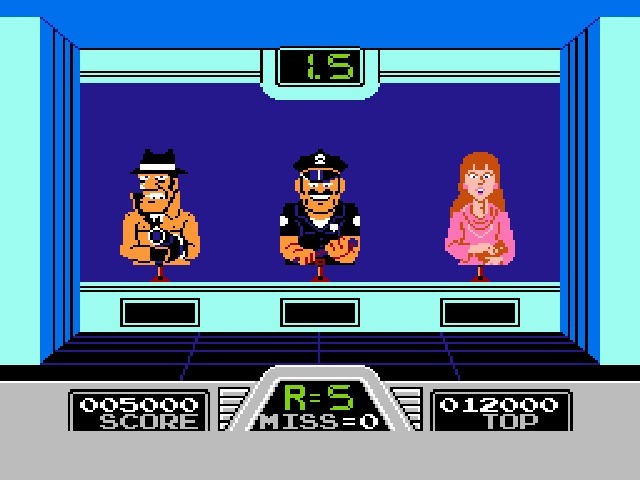 The game has three “enemy” cutouts and three “innocent” cutouts. They appear on scene briefly and you have a very narrow window of time to both identify them and shoot them if needed. Hitting innocents is bad. Missing bad guys is bad. Killing bad guys? Yep. Good. 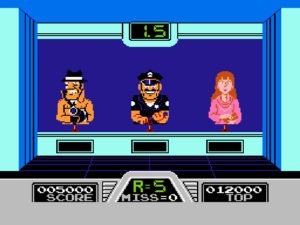 The three games are identified by letter, and selectable at the opening screen. The ‘A’ game places you in a booth at a firing range. Three targets are brought out at a time, moving sideways so you can’t see what (who) they are. Once in position they quickly turn to reveal themselves, complete with a little hydraulic-sounding “ca-CLAK!,” and you have seconds to pick out the bad guy or guys and shoot them before they turn sideways again and you lose your chance. You’re then shown the target you missed, or the poor innocent you blasted. It’s reminiscent of the old carnival BB gun games, with the scrolling rows of targets. I also am familiar enough with this “targets move into position and then turn to face you” idea that I must have already seen it in some cop movie. If you shoot the correct bad guy, he spins around comically and the game moves seamlessly on. If you “miss” ten times then the game is over. 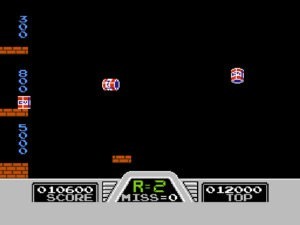 Otherwise, the game goes on forever and ever with the time you have to shoot shortening each round if you do well (this time is shown in seconds on a display at the top of the screen, and let me tell you 0.6 seconds is a chore). Yeah, if I was looking for guys with guns, this is a good place to start. The ‘B’ game has the same basic rules as A, except you are traveling through a fabricated city. This is clearly the mode that gives the game its name, and the city is an obvious nod toward the real “Hogan’s Alley.” Popups appear randomly in designated areas such as windows or behind boxes, but still scroll and reveal as in the ‘A’ version. They will also appear in the same area and manner based on the building type, but can randomize the character they show; so the mafioso in the window may be a poor old librarian the next time you pass. This time you don’t know how long you have to shoot them, and more then one target is usually on the screen at the same time. Again, 10 misses and you’re out. If you reach the end of the level, a new one loads with a slightly redesigned layout (though it still uses the same set pieces and same buildings, just in a different order). Like the other games, this one will simply go on forever until you run out of lives. Still, the urban setting and the greater potential for unexpected bad guy appearances makes this game a little more exciting. The ‘C’ game, or Trick Shot, is really more of a bonus game with nothing to do with the others. 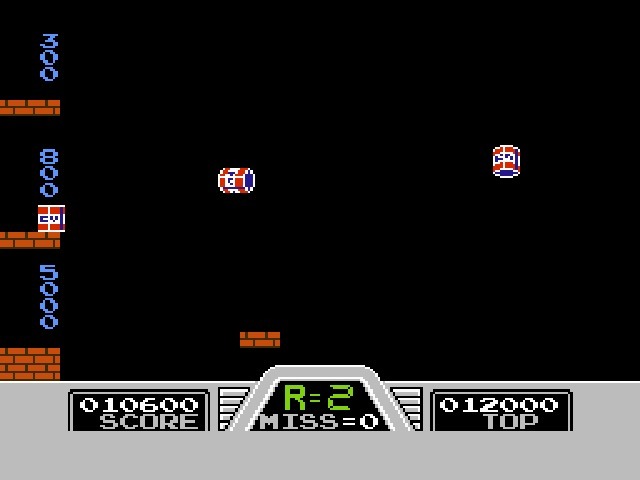 Cans are thrown out from the right side of the screen and you must guide them to bounce them onto one of three stacked platforms on the left. You keep cans aloft and in play by shooting them. If you let a can fall below the screen you “miss” and 10 misses ends the game. The cans present smaller targets though, and their movement can make it tricky to get a bead on them. The game can’t detect exactly where you’ve shot a can, so you can’t truly direct them by shooting a specific side. A can will always jump up, to the left, and spin faster each time it’s shot. Too many shots result in a faster and harder to hit can. The game’s graphics are pretty average; colorful and unshaded, like any other early NES title. The cardboard cutouts are the best looking pieces of the game, and it’s easy to differentiate between who is friend and foe. The sets/backgrounds are a little worse though. The shooting range in game A is pretty bland. Mario called regarding games B and C – he wants his set pieces back. You’ll quickly recognize the bricks and pink I-beams as reused. The rest of the buildings are comprised of single colors, making a set about as “cardboard” as the targets you’re shooting. The sound is pretty average, with the standard ka-chhh sound of the light gun’s shots, and a few music loops which are forgettable, at best. Oh yes, a warning: the noise the cans and cutouts make when they spin will ship you overnight mail to madness if you play long enough. Unlike Duck Hunt and many other Zapper games, Hogan’s Alley doesn’t cling to the light gun as its only lifeline. It’s certainly a better game if you can play it with the gun, but it’s not quite a one-trick title if you’re stuck with the mouse. The time limits will remain pretty strict, and always work to keep the challenge high. The variety in modes help somewhat as well, and having to take a split-second to identify your target and check out a moral clearance to shoot it, will always give it an edge over games whose challenge end once you line up your sight and pull the trigger. Its only clear fault is that it’s endless loop of the same game, and makes beating your high score the only real challenge. If you haven’t been spoiled by modern gaming technology’s advancements of “plots” and “stories,” then you might find some enjoyment here. Challenging, even without the light gun. A beat-your-score challenge that never really goes anywhere.